Problem Management is a key process for improving service availability. In order to obtain value from the Problem Management it is necessary to understand some of the techniques and methodologies used to determine to root-cause, one of the key activities in Problem Management. This session will introduce you to the value of various techniques used in root-cause analysis: brainstorming, Structured Problem Solving, Pain Value, chronological, Ishakawa diagrams, and Pareto Analysis methodologies. Learn how to use these methodologies and understand which are appropriate to your environment. John is an internationally known educator and consultant. He has 20+ years of experience in architecting and delivering Service Management solutions. He holds an MSA in Innovation & Technology from Boston University, the ITIL v3 Expert Certification, ISO.IEC 20000 Consultant, ISO/IEC 27002 Advanced Certificate in Information Security Management and was recently recognized with as a Distinguished Professional in Service Management (DPSM). 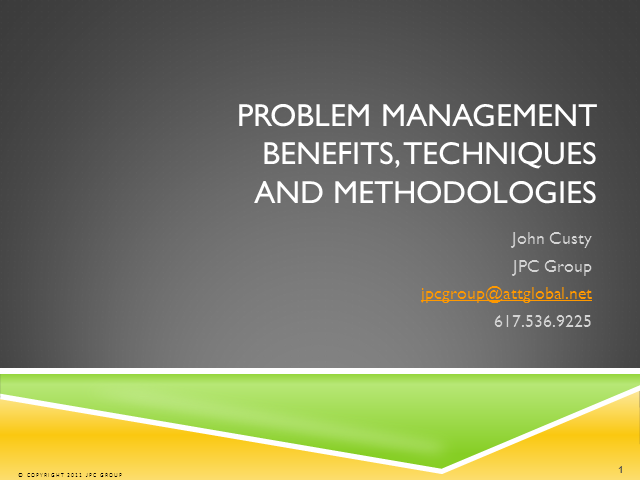 John is the Managing Consultant at JPC Group in Boston MA.